Thanksgiving is fast approaching, and for many people that means a big turkey dinner, complete with creamy mashed potatoes, creamed corn, buttery dinner rolls, candied carrots and, of course, pumpkin pie. But that delicious meal is typically enjoyed sitting around the table with family members who all have different stories, opinions and histories. Keeping your politically correct cap on can be challenging in such close quarters, and social etiquette can sometime fly out the window when you are around those you have known your entire life. The walls come down and touchy subjects might be broached. What’s the best way to avoid family drama at Thanksgiving and leave on a positive note? Talking about how school is going for your niece or about your upcoming trip to the Caribbean can keep the conversation going without getting into any dark areas. Try to keep the conversation light but interesting. Asking who your uncle is voting for in the upcoming election or your brother-in-law his opinion of the new full-body scanners at the airport might head south faster than your plane to Mexico. Bringing differences of opinion to the surface can cause arguments, which can take an ugly turn quickly. This might seem obvious, but asking everyone to talk about something positive in their lives can keep things positive and let you know things happening in your family members’ lives that you might not have known. You never know where the conversation might take you going this route — but it’s usually positive. Sometimes silence can be your best armour. Just listening to the conversations going on around you and not jumping in with your two cents can be the easiest way to avoid conflict. Speak when spoken to and be polite, but keep it short, to the point and move on. Avoiding the other adults completely is sometimes the easiest way to stay clear of drama. Sitting at the kids’ table can seem daunting — they can be messy, loud and someone will inevitably spill their drink. But kids are funny, honest and forgiving when you talk to them with respect and at their level. Asking them what they want to be when they grow up, if they have a boy/girlfriend at school, how old they think you need to be to move out, etc. will more than likely give you memories to last a lifetime… and to share at their weddings. Before the meal most people want to socialize with a cocktail and stay out of the way of the cook. After a long heavy meal, most want to lean back in their chair, unbutton their pants and relax. Clearing the plates will keep you busy and out of the line of fire. It also gives you opportunity to pack yourself a doggie bag full of delicious leftovers. You might be surprised which family members offer to dry as you wash. Getting one-on-one time with someone who takes the time to help will result in a more meaningful heart-to-heart conversation. 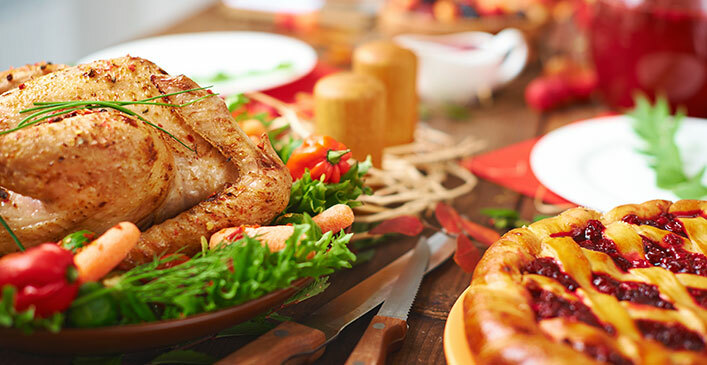 Following some of these tips should help keep the thankfulness in Thanksgiving. So jump in with both feet, enjoy your turkey and don’t forget to say please when you ask for the gravy to be passed.